Yesterday I was lucky enough to sample the delights of one of London's finest patisseries. 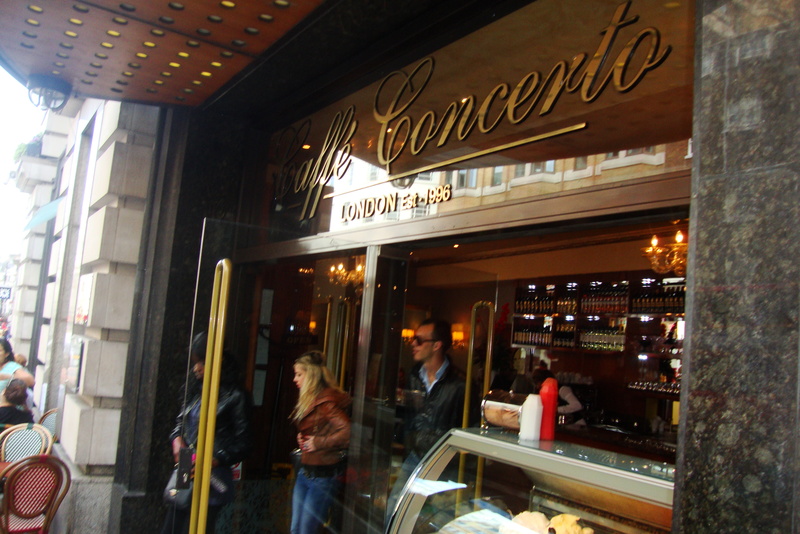 I ventured to Haymarket to indulge in tea and cake at London's Caffé Concerto. 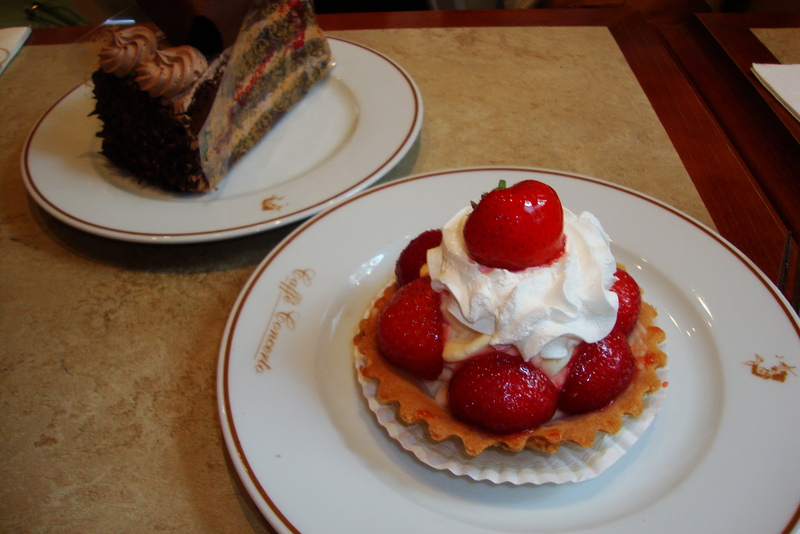 Here you will find an array of Italian dishes, gelato and their speciality, cakes and gateaux. I was greeted by decadent interiors - the seats are cream leather and the décor is gold and refined. They also have music, in some branches live music-, or just music being played throughout. It is a mix of a 40's inspired tea room, I felt as if I had stepped back in time, with a good dose of Italian flare and a dollop of London cool. As I previously mentioned I went to Haymarket, but you can also find Caffé Concerto in: Westfield; Chelsea; Knightsbridge; Kensington; Tottenham Court Road and St Paul's. Each one offers a slightly different experience as they are each decorated differently or feature different live acts but the menu remains the same. If you specifically want to visit and experience one of their live bands, which are usually of the Jazz persuasion, you can check the website for upcoming events. You can also pre book a table via the website as well as look at the menu or order a specially designed cake for a special occasion. I would recommend going there for afternoon tea or a treat as the desserts and ice cream are fantastic. However, they do offer an extensive menu which includes anything from Antipasti and Ciabatta to a main meal suitable for an evening meal. I am sure they are equally as good but unfortunately, I was not there to have a full course meal. For three people having a pot of tea and a cake each it came to around £28. 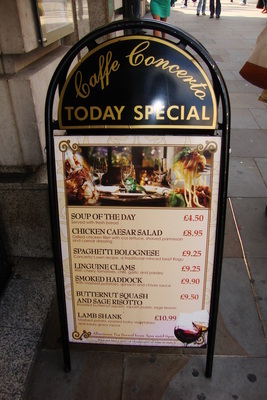 You can check the menu by following the link in order to see a full list of prices. Caffé area: 9am to 8pm - Restaurant 12 pm till 11pm Monday to Friday. 11am till 11pm Saturday. 11am till 6pm Sunday. Ideal for families, shoppers resting their weary legs, special occasions and cake connoisseurs. Why? Who doesn't like tea, cake and gelato? 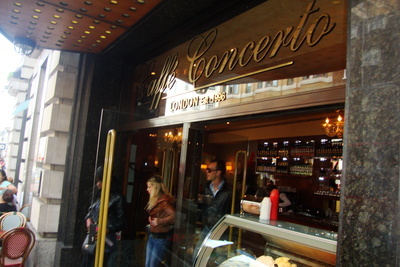 I enjoyed your review, but your experience of Caffe Concerto is far better than mine. I visited the Regent Street branch with a friend back in the summer. There were two staff on duty; the waitress didn't have a good command of English and the other man appeared to be the manager. The waitress had trouble understanding our requests and questions and giving the answers that we needed. My friend enjoyed her pastry but my cream tea was abysmal and I complained. The scone was heated through in a microwave so it tasted like a piece of sponge; hardly an advertisement for a visitor who has never eaten one before. The manager deducted the service charge but I won't be going back to any of their branches again. It's a pity as they look so tempting from outside.